Alibaba (NYSE: BABA) stock will begin trading on the NYSE this morning after one of the largest initial public offerings in history. Now, we’re seeing a theme in our reader questions. How can I buy Alibaba stock? Is it too late to get in on the Alibaba IPO? Should I Buy Alibaba Stock (NYSE: BABA)? 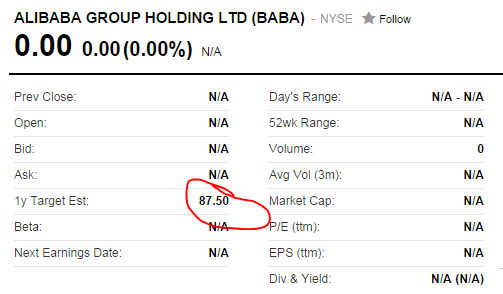 BABA stock was priced at $68 per share last night, but the Alibaba stock price could open up higher when it hits the market this morning. Still, the answer regarding Alibaba stock is "yes." This is a historic deal, and profit opportunities like Alibaba stock come around once or twice in an investor's lifetime. One way to go is to buy half of your ideal position in BABA when the market opens on Friday then look for another opportunity to pick up the rest. Alibaba is going to set records for growth and for profits; it's the kind of company you want to own. "According to the research I've seen, e-commerce in China is projected to hit $540 billion by 2015, and that's just for starters," said Money Morning Executive Editor Bill Patalon. "By 2020, China's e-commerce market will be worth more than the United States, the United Kingdom, Japan, Germany, and France combined. So we know that growth is coming… and we know that Alibaba is the No. 1 gun." According to Money Morning's Chief Investment Strategist Keith Fitz-Gerald, "we could see anything on that first day of trading ranging from a 5% decline to a 30% increase. The former is a possibility, but I think there's so much demand for shares that a 30% pop in price may prove conservative when the closing bell clangs Friday afternoon." However, it's the long-term potential of the Alibaba stock price that has Money Morning experts so excited. "I think with the Alibaba stock price, the issue isn't what it will do on Friday, I think it's what it will do over the long haul, Patalon said. "I think Alibaba has the potential to become a trillion-dollar company. When the stock debuts on Friday, you're looking at a value of about $168 billion. For the stock to reach my target it's going to have to go up seven-fold. That's a huge return. You just don't find those every day." For U.S. investors hoping to get in on the action and profit directly from the IPO, all orders for allotted shares had to be placed by 4 p.m. EST on Wednesday Sept. 16. But there are several exciting "backdoor" ways to play this historic offering, too. We recommended one such stock to members of our premium service months ago. Investors who followed along have enjoyed total returns of more than 30% – with more ahead. Of course, it wouldn't be fair to paying members to share those plays here. But if you're interested in joining them, click here. Sign up here to access these three profit plays.